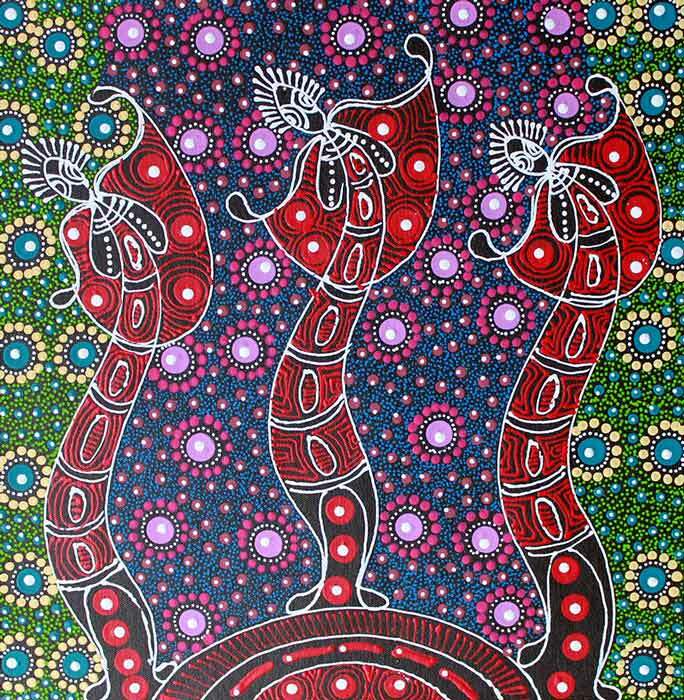 This painting depicts the ancestor dreamtime sisters who watch over the land and celebrate through Awelye Ceremonies (women's ceremonies involving song, dance and body painting). Subjects Arlatyeye (pencil yam) during wet and dry seasons, Awelye (Women’s Ceremony), Bush Foods, Ancestors- Dreamtime Sisters (spirit figures). Colleen is a self-taught artist and comes from a strong family tradition of Eastern Arrente painters, including Kathleen and Gabrielle Wallace. Colleen has been painting since 1990 and was raised by her mother at Santa Teresa and Alice Springs. Colleen’s Yam Dreaming links to the country of her mother-in-law, Ada Bird Petyarre (c. 1930 - 2009), a renowned artist from Utopia. Colleen’s grandfather, Kenny Tilmouth Panangka passed on the rights to paint the Yam Dreaming story. Colleen’s artworks incorporate Awelye (ceremonial body paint designs), ancestor dreamtime spirits and detailed paintings associated with the bush yam, the yam vine and flower, which grows in “green times” (during rain). Colleen is known for her fine dot paintings and vibrant use of colour in her exuberant, Dreamtime Sisters series. Colleen lives at Mulga Bore, Utopia, and also resides at times in Alice Springs, with her husband Colin Bird (Ada Bird Petyarre’s son) and their children.